Battery Longevity ◰ « Have You Seen This Cache? That only covers two years! The lifetime of a lithium ion battery is reduced by the cycle of charge and discharge… but also by being completely discharged, and by being completely charged. (Older readers may remember being told to occasionally completely discharge batteries — that was Nickel-metal Hydride Batteries that had a memory effect; it’s bad for modern batteries.) 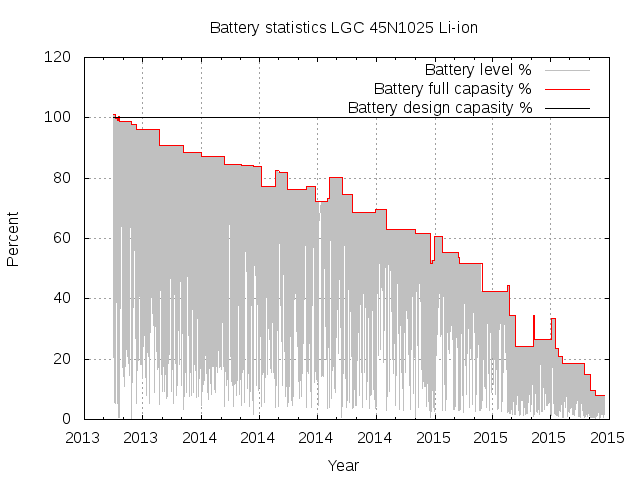 Manufacturers put a circuit in to stop discharge shortly before hitting 0% charge (though they present this stop point as 0%), but with every reviewer judging devices based on battery life they’ll charge the battery as high as possible. My next step was to reduce charge cycling and time spent at maximum charge. For my Lenovo X1 Carbon 3rd Gen, I had to install tpacpi-bat and its system dependency acpi_call. 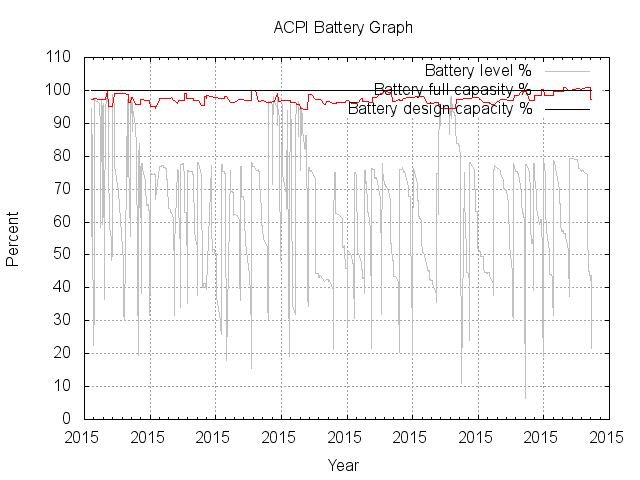 One quirk: when the laptop is running off the charger but not charging the battery, acpi -s and cbatticon both say the battery status is “Unknown” instead of the usual “Charging” or “Discharging”. I haven’t looked into patching those to say “Not charging” or “Powered” or something. There’s a lot of noise in the red battery capacity line, but I hope it’ll stay quite level. Unfortunately this is an experiment with no control group: I don’t know what it would look like if I’d never made this change. But charging to 80% is only a minor inconvenience and charging fully, mostly for plane flights, is one command (sudo systemctl stop tpacpi-bat), so it will very likely be worth it over the next few years. Sorry to hear about the screen. Do you have any updates on the battery longevity? Previous PostPrevious Have You Seen This Cache?